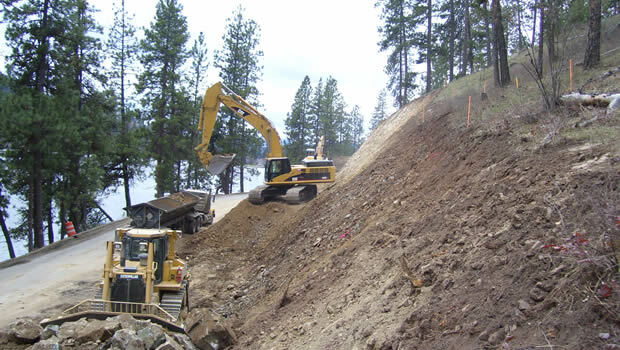 Fernan Lake Road was a Federal Highway Project located in Fernan ID, .60 miles from Coeur D’Alene ID. The project was 10.524 miles of grading, rock excavation, drainage, base paving, and bridge structure. The overall purpose of the project was to improve safety of Fernan Lake Road. Built in the 1930’s the road was very narrow and winding. A few miles of the curves were straightened out and widened with reinforced edges where necessary to prevent erosion. The improvements on this road will allow for safer recreational access and improved parking. Project challenges included excavation of 230,000 cubic yards directly adjacent to the lake, blasting rock cuts and 45,000 ton aggregate base.